PRICE REDUCED! 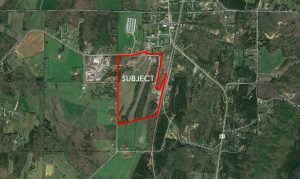 Murray Co. / Crandall, GA, 91.79 ac Industrial Site, $1,500,000! One of the largest and potentially most productive industrial sites available! Located just north of the Appalachian Regional Inland Port, this property offers a private air strip, hanger and rail road spur! Well suited for multiple large distribution warehouses! Call or email Mike Newsome for details.